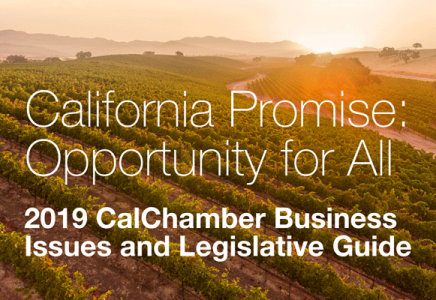 The California Chamber of Commerce 2019 Business Issues and Legislative Guide is available now on the CalChamber website at www.calchamber.com/businessissues. This easy-to-reference publication presents ways to make progress on longstanding issues facing the state. 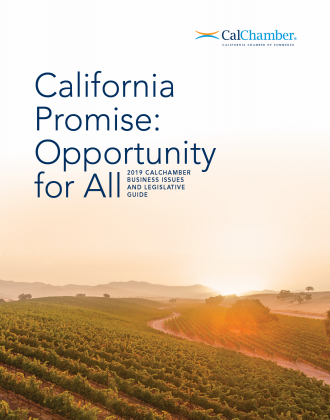 To fulfill the California Promise: Opportunity for All, the state should pursue: fiscal stability for government programs and spending; putting California on a path to increase available housing; workplace flexibility—including mutually agreed upon options for workers and independent contractors; fostering a skilled, well-prepared workforce; and keeping energy affordable by minimizing costs due to California’s climate change policy. Chevron is the premier sponsor of this year’s Guide. Hard copies of the Guide are being mailed to CalChamber preferred and executive members who receive printed copies of Alert or who previously signed up for the hard copy Guide. Preferred and executive members receiving the email Alert can request a hard copy of the Guide by emailing alert@calchamber.com. Additional hard copies are available for purchase ($20 each). Mail checks to California Chamber of Commerce, P.O. Box 1736, Sacramento, CA 95812-1736, Attn: Business Issues. An e-book edition of the Guide, compatible with smartphones, tablets and desktop computers with an e-book reader installed, can be downloaded free at www.calchamber.com/businessissues. A PDF file also is available. In addition, issue articles can be viewed as web pages and downloaded as individual PDF files.